This a going to be mainly a blog about the little things that we notice in Japan. Some are funny, some weird some maddening and and somethings like the first one quite poignant. "(Learning of) the constant effort to make harmony prevail over confrontation. (Learning) the Confucian approach to a society of relationships based on trust, obligation and a commitment to loyal action on behalf of others. All so very different to the Western pursuit of personal achievement." The other day we watched one of the few tramps we have come across in Japan. He approached a public bench near the river and, even though it was cold, took off his shoes to lay down .... out of consideration for others! The Ota river which flows by our flat is generously peopled with Koi (all sizes but mainly about 300mm in length). Generally they float about on their own but several times now i have seen a group of them all facing one another in a circle chatting. The Hiroshima midwinter swim is a yearly event where a few people (about 40) strip off and go swimming in the river by the A bomb dome. For some reason they swim ‘Edo’ style. The Edo period was a time in Japan’s history and is celebrated here by people carrying samurai swords, doing calligraphy, twirling fans or ornate umbrellas, firing bows or doing strange swimming as they would have during the Edo period. I obviously heard wrong so showed off and promoted our fundraising efforts for Nepal. I could have sworn they said Ego. Anyway we pitched up at 11.00 and met our friend Lee Ridgewell who had agreed at last minute to do it with me and after a few formalities like a prayer, warming up exercises and some drum banging we got in. Weirdly although its mid winter and similar to England in temperatures it wasn’t that bad. My legs felt the cold to the point of aching for a moment or two but there was no gasp as testicles, stomach etc hit the water. 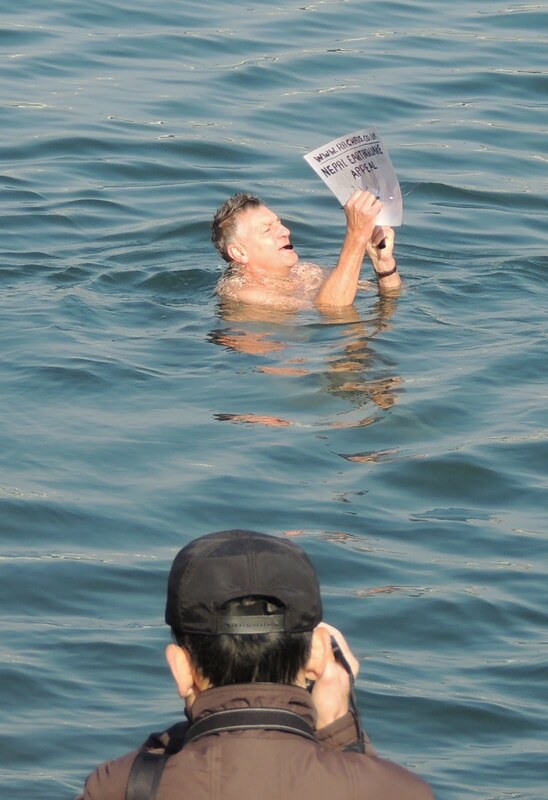 The current carried me down stream and as I was treading water I wrote “it’s cold” on a board advertising the appeal. Coming out again some 25 metres or so later there was applause from the onlookers and suddenly Lee and I are being papped big style. TV cameras, interviewers, newspapers, tourists and locals all crowding round to get a picture of us or with us. Getting our names, ages, where we were from, why we were doing it. Fantastic fun…I even think I forgot to hold my stomach in! A good thing to do, a good story to tell and a good memory to have. One final thing that was funny. 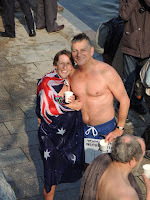 Once the crowds had moved away a little and it was time to strip off my costume and don my undies there were still a couple of Japanese men lurking around trying to click pictures – Don’t know why with the cold water and everything there wasn’t much to see! Gymnasium equipment always has a little towel affixed to it so the user when finished wipes down the machine. This is assiduously done and it can sometimes take a minute of cleaning before the locals are happy to leave it. The toilets of the gym have super large toilet shoes in the doorway (slip on mules for giants) so that you do not need to remove your trainers. Often they are speckled with drops of pee on the top cover. Finally, on leaving the gym, many people turn round in the doorway to face back in and bow to the room saying "shitsureishimasta" roughly meaning "Excuse my interrupting you"
Miwa San (Rachel's Japanese teacher) made a mini Osechi box for her. Osechi is the name for certain preparations of food that is eaten at new year. This box contained Omelette - yellow colour of gold so good luck for wealth. Kuromame - black beans for a prosperous work life. Daicon, fried tofu and citrus peel - for mystic powers and purity (health). And little tiny fried sardines with chopped almonds - for a successful harvest. (The fish used be used as fertiliser for the rice just before harvest). She was also given some chopsticks (ohashi) to eat with. These are generally the chopsticks that you would use for the three days when you may be celebrating the new year. These particular chopsticks had both ends shaped, not square at the top. This is so that when you eat God eats with you. Traffic wardens move about the city in pairs on bikes and wear a light green uniform. For obvious traffic parking violations a ticket is issued but for the more contentious ones they take photographic evidence and whip out tape measures to ascertain clearance from curbs, road widths and god knows what else. 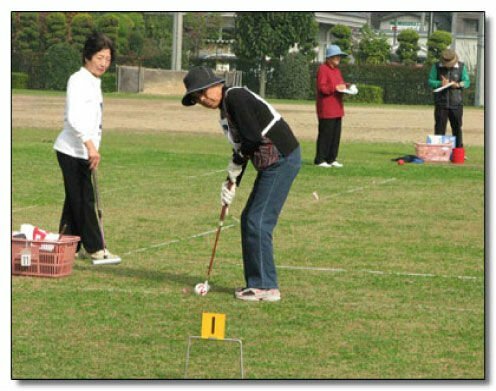 There is a game played by the aged populace here called 'Gateball' It is a cross between croquet and golf. Mallets are used instead of clubs and the playing area is divided up into greens (like a golf course) except that they are only a bout 40 metres long and 5 metres wide. Balls are teed off as in golf, but to get the point you need to get it through the final gate. Interestingly there is always a portaloo or two on the small 9 hole courses (incontinence can be a bugger for a sportsman/woman). Cabs are black sedans and resemble the MIB car. 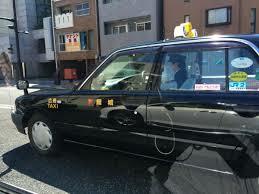 Cabbies are also dressed like Tommy Lee Jones but additionally wear a black peaked cap and white gloves. If stopping a cab on the street he will pull over and the back door opens automatically to beckon you in. Similarly, when dropped off the money is paid before the door is automatically opened by the driver.... no runners for them! If you book a cab to collect you from your home it will (without fail) arrive 5 minutes early and the cabbie will be waiting beside the car and bow as he opens the door. Generally there are few accidents on the fast road as drivers are considerate, indicate their intentions, drive at sedate speeds and are calm. In towns, however, I have seen numerous dinks occur at traffic lights. In Japan all the traffic lights a long a stretch of main road will change at the same time so you will see a long row of red or green lights stretching away in the distance. If you choose to turn off a main road you will invariably have to cross over a pedestrian crossing (also controlled by pedestrian lights) but, because they are walking in the direction of the green lighted traffic you have to wait. It is rare that a week goes by when a car is turning and suddenly a bike zooms across and he has to stop or a pedestrian is crossing unnoticed and brakes get jammed on. The result being that the car following the turning car rear ends them. This makes turning left pretty scary but its downright terrifying turning right with traffic speeding coming up outside lanes towards the back of your car and you having to judge whether you can cross over the oncoming traffic and avoid mowing down pedestrians or cyclists on the other side. Several times a day a weird cartoony song echoes around the neighbour hood as yet another van selling something, anything. We don't know what all we do know is that its screechy. I think we have mentioned the baton waving associated with the roadworks in Japan and how there is always plenty of people detailed to alerting drivers and pedestrians that danger is afoot. Today we saw the ultimate in H&S provision. 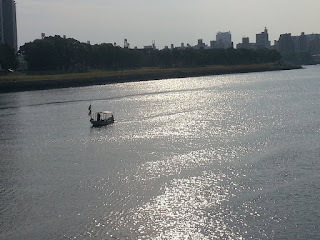 The picture is the Ota river. 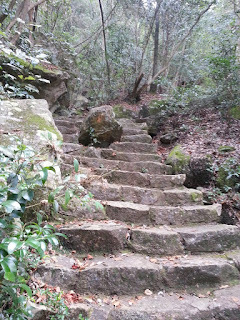 it is wide and straight and runs through part of the city of Hiroshima. They are doing some work on one of the bridges and one of the archways (there are 7) is not navigable. The river itself is blocked by weirs about a kilometre up river so there is virtually no river traffic but either side of the bridge - about 500 metres either side is a little man in a boat waving a flag and a baton. Great post, can a river be peopled by fish? Do people donate their koi? Excellent questions, to which I have no answers but will inquire about.